Im on a road (a slightly bumpy one) to eating a little healthier. I decided to trade in my pasta for veggies. I am quite obsessed with this new spiraled veggie craze! I absolutely love Zucchini noodles or as some people call them, Zoodles. A while back I decided to try zucchini with my pasta sauce and not only did I love it, Bryan and Zoe did also. Bryan didn’t even know what he was eating but he tore it up. The Hubs is always up for trying new foods and will basically eat anything(mostly anything). Miss Zoe on the other hand can be very picky at times. When she sees anything green on her plate, she avoids it or will toss it to the side, on the table, on the floor, well you get my drift. She does not like it. I have to make smoothies for her and sneak her greens in that way. She loves pasta, so when I mixed it up with the marinara and meat sauce, she could not tell the difference. She enjoyed every last bite. Zucchini has such a mild flavor, so you can serve it with a lot of different things. Zucchini can be sautéed, boiled, and even served raw. 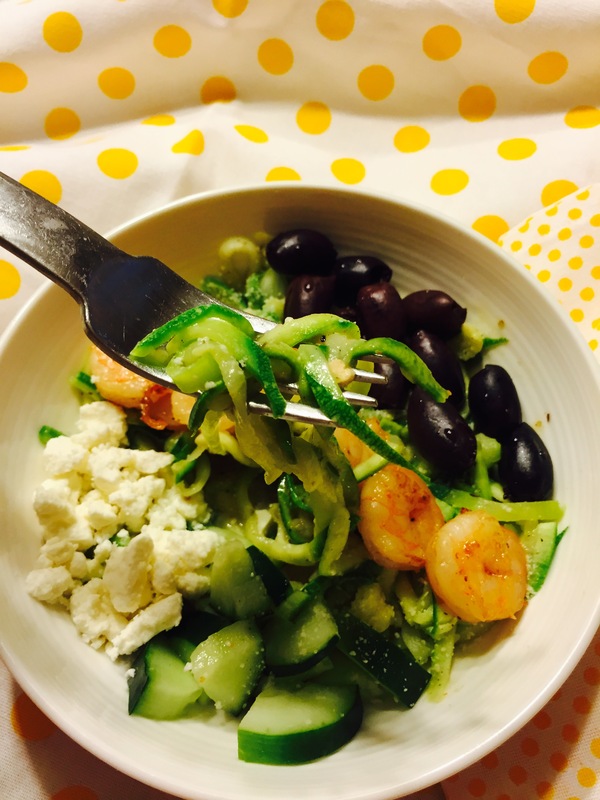 Instead of using lettuce for this salad, I substituted the zucchini for it. I also decided to leave the zucchini raw so you will still get that crunch you would be missing from the lettuce. It turned out to be very delicious. I hope you enjoy it. *Note* you will need a veggetti spiral vegetable cutter or similar gadget. 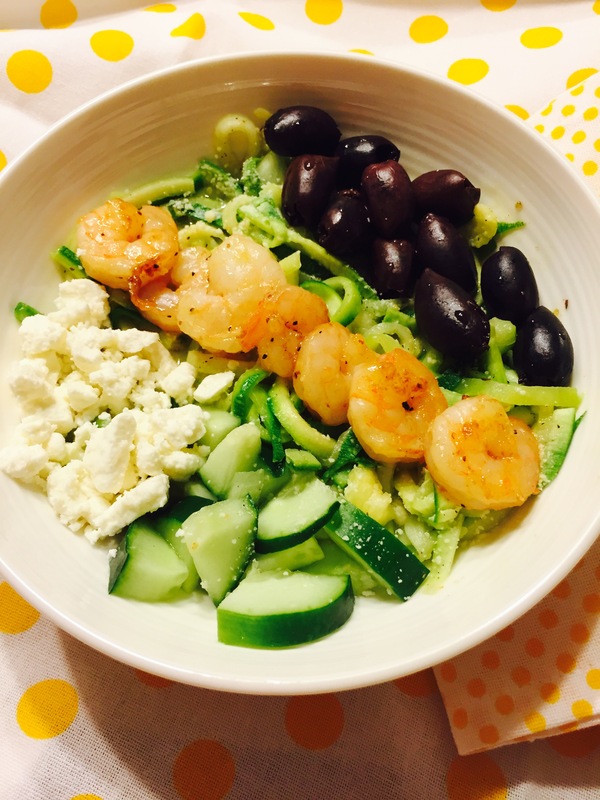 Place Zucchini noodles in large bowl and sprinkle with salt and pepper. 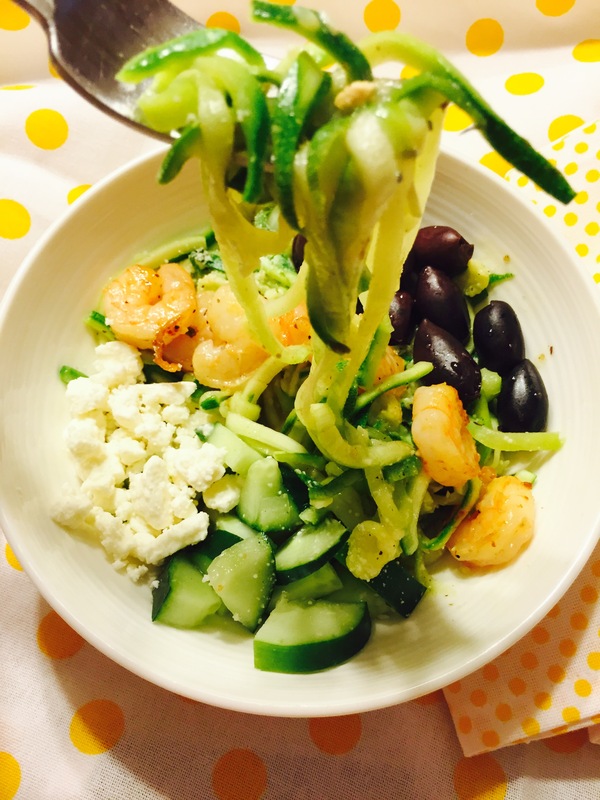 Toss Zucchini noodles in greek vinegrette dressing. Assemble remaining ingredients on top of salad as desired.